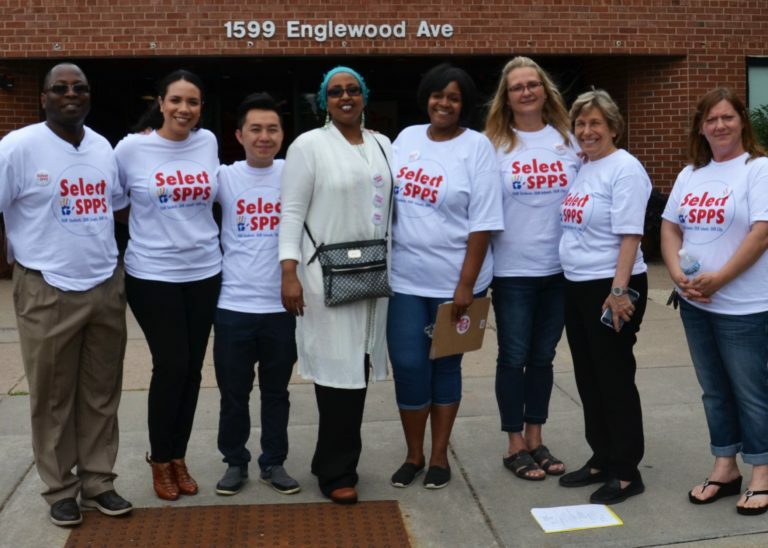 SAINT PAUL, Minn. (August 8, 2018) — During weeks of door-to-door canvassing this summer, nine members of the Saint Paul Federation of Teachers (SPFT) helped enroll scores of children in the Saint Paul Public Schools (SPPS). The Select SPPS project was a collaboration between the SPFT, the school district, and the American Federation of Teachers. The six-week effort concluded August 4, with a celebration for students and their families at the Hancock Recreation Center in the Hamline-Midway neighborhood. The project was launched in June by leaders of SPFT and SPPS, along with Saint Paul Mayor Melvin Carter, during an event at Hamline Elementary School. Backers of the effort saw it as an opportunity for families across the Saint Paul community to learn more about the city’s public schools. “I look forward to continuing the partnership, welcoming our new students and encouraging families to Select SPPS,” Dr. Gothard added. The project was also aimed at enrolling new students in SPPS and drawing some who have left for other school options back into the local public school system. Increasing enrollment would make the district eligible for more state education funding. The nine family advocates, who generally worked in two-person teams, visited over 7,300 homes. When no one was home, they left printed information about SPPS. They had more than 1100 face-to-face discussions with parents or other family members about public school programs and opportunities. They helped families complete enrollment forms to sign up 103 new SPPS students. The union estimates that new enrollments will translate to half a million dollars in additional state funding for SPPS. The Select Saint Paul program is one part of an agreement reached between SPFT and the school district during the last round of negotiations to increase funding for public schools. The union and the school district are working together to support a school levy referendum that will be on the ballot in November. They also are jointly lobbying for funding on a state and national level, and partnering to seek additional funding from large corporations and medical and higher education nonprofits in Saint Paul.